What is the Kansas Historical Society? Who can help me use Kansas Memory, buy a reproduction, or research Kansas history? How can I view Kansas Memory artifacts in person? What is My Kansas Memory and how do I use it? I don't want anyone to see the items I have stored in My Bookbag. What can I do? Can I put the same item in My Bookbag more than once? What kinds of materials are in Kansas Memory? Why do you provide information at the item level rather than at the collection level? How do I cite materials from this website in a research paper? How do I locate the source of unpublished materials on this site? What are primary sources and how do I evaluate them? Are transcriptions (text versions) available for all handwritten materials? Why are there mistakes in the transcriptions? How do I help transcribe materials? What is the color grid that appears with some images? How do I browse this site? What information is searched when I use the search box? How can tab browsing help me use this site? What is the curriculum standards category and how do I use it? How do I subscribe to the RSS feed and what does it do? How can I purchase a copy of an item from Kansas Memory? Should I be concerned about copyright if I use materials from Kansas Memory? Do I need permission to use materials from Kansas Memory? May I post images from Kansas Memory on my own website? May I download an image for a presentation? How do I print an image on my personal printer? How do I order a high-quality photo print? The Kansas Historical Society was established in 1875 by the Kansas Editors' and Publishers' Association to save present and past records. In 1879 the state enacted legislation that recognized the Historical Society as "the trustee of the state" for the purpose of maintaining the state's history. Today the Historical Society operates with four divisions: Administration, Cultural Resources (Archeology, Historic Preservation, and Historic Sites), the Kansas History Museum and Education, and State Archives. The Society serves as the State Historic Preservation Office (SHPO) and the State Archives. The Society is headquartered in Topeka, Kansas where you can view many of the items displayed on Kansas Memory. Schedule a visit or learn more about the Historical Society. For help with Kansas Memory, please use our contact form. If applicable, please include your username in your message. To buy a reproduction, contact our reference staff at KSHS.reference@ks.gov or 785-272-8681, ext. 117. Please see also our price list and our permission and use fees policy. Research questions may also be directed to our reference staff at KSHS.reference@ks.gov. You can see artifacts from Kansas Memory (and many others!) in person at the Kansas Museum of History, at the State Archives, and at our 16 historic sites. For more information, click Visit the Kansas Historical Society or call 785-272-8681. No. Registration is not required to use the site, but additional features are provided to registered users such as saving and organizing items, sharing information with other users, and customizing display options. Need more help? Contact us. Please include your username in your message. Choosing the "Customize" link in your user profile allows you to update your personal information, including your email address. First, log in to your account using your username and password, then choose "Profile" and "Customize." Click the "Save" button after editing the fields in your profile. My Kansas Memory is a menu of additional features available to all registered Kansas Memory users. These features give users the ability to save and manage item records (in My Bookbag), share information, and customize display options (in My Profile). While we encourage all users to share their bookbags, we understand that some people will want to keep them private. Items in your bookbag that are not in folders are automatically shared with everyone. No. An item may only exist in a bookbag one time. Most materials included in Kansas Memory are primary sources from the collections of the State Archives at the Kansas Historical Society. These collections include photographs, manuscripts (such as letters, diaries, journals, etc. ), books and pamphlets, maps and drawings, and state government records (such as governors' papers, legislative documents, and election returns). In addition, the Museum and Cultural Resources divisions have contributed images of historic artifacts and structures. Click here to browse through all topics on Kansas Memory. Some materials have also been featured in other digital projects. For example, many materials included in Territorial Kansas Online, a virtual repository for territorial Kansas history, are also available in Kansas Memory. The State Archives and Library at the Kansas Historical Society holds more than 400,000 library books and other publications, copies of most newspapers published in Kansas, 10,000 cubic feet of manuscript materials, 30,000 maps and drawings, half a million photographs, and more than 30,000 cubic feet of state government records. The materials currently on Kansas Memory represent a small fraction of those collections. While we will continue to make more materials available on Kansas Memory on a regular basis, many materials in our collections will remain accessible only through microfilm loan or through the Society's research center in Topeka, Kansas. Learn more about accessing the Historical Society's diverse collections see Our Collections. Presenting sources as individual items makes them easier for researchers to locate because the items can be described in greater detail. We can also select items that meet the needs of specific users, such as secondary school history teachers and students. We are currently working on ways to present entire collections through Kansas Memory. This would mean a dramatic increase in the number of items available through Kansas Memory. But it would also mean materials would be described in much less detail and may be more challenging to locate. When citing material from Kansas Memory in a footnote or bibliography, consult an approved style manual (CMS, APA, APM, MLA) and follow the format appropriate to the type of material (book, newspaper, unpublished letter, etc.). Also include the full name and address of the website, and the name of the creator as Kansas Historical Society. Citations for unpublished materials (letters, diaries, account books, etc) generally include the title and date of the item followed by the name and number of the manuscript or archival collection. Citations for published materials usually include the author and title of the item followed by the place, name, and date of publication. Kansas Historical Society. Kansas Memory. www.kansasmemory.org. Edna Heim to Clarice Snoddy, August 31, 1938, Clarice Snoddy Coll. #123, Box 1, Kansas Historical Society, Kansas Memory, www.kansasmemory.org. Most unpublished materials on Kansas Memory derive from manuscript or archival collections held by the State Archives and Library at the Kansas Historical Society. The details section of the item page lists collection information as "call numbers." Names of manuscript collections may begin with the names of persons, businesses, organizations, or subjects, and are usually followed by the collection number and box and folder information, as in Joseph Little Bristow Coll. #6, Box 31 Folder 6. Names of archival collections may begin with the title of a state office or name of a state agency and may be followed by the name of a public official or subordinate agency unit, and thereafter by box and folder information, as in Governor's Records, Hoch, Box 20 Folder 3. While secondary sources give a second-hand account of an event (such as in historical articles and textbooks), primary sources are accounts by an eyewitness or the first recorder of an event. Primary sources can take many different forms including photographs, diaries, letters, newspaper articles, speeches, data obtained through original research, statistical compilations, or legal requirements (such as U.S. census records and public records), creative works (such as poetry, music, art), or artifacts (objects used or present at a certain event). When evaluating sources such as these, it is important to ask questions of the material. For example, it is important to realize that just because an author claims to compose an "eyewitness account" does not mean the account is "true." Consider what opinions and values the author displays, think about what his or her motives might be for writing what they did, how he or she communicates the message, and compare and contrast that message with the information in other primary sources. Extensive research of this type--incorporating critical analysis of primary sources such as those found on Kansas Memory--serves as the foundation for what you read in history books. Transcriptions of handwritten materials are intended to reflect the form and content of the original as closely as possible. By recording the materials as written, the transcriptionist seeks to preserve the integrity of the original and its value as a record of historical events and ideas. For this reason, misspelled words, grammatical errors, and possible historical inaccuracies are recorded in their original form. Mistakes in the transcriptions may also occur because the author's handwriting may be difficult to read, or because of typographical error. The transcriptions provided on Kansas Memory are intended to be a research aid and should not be considered the authoritative copy of the source. The Kansas Historical Society relies on volunteers to transcribe the handwritten documents on Kansas Memory. If you would like to volunteer, please contact us. Volunteer transcriptionists work from home or in Topeka. The color blocks that are seen in some images in Kansas Memory are a calibration tool used during the digitization process. By providing a consistent color reference, the use of color blocks ensures that the scanned digital images accurately reproduce the appearance of the original documents. They are not a part of the original document. The category browse feature (the left hand column on the home page) allows you to browse for items using everyday terms. Every item in Kansas Memory is linked to multiple categories. Choosing one category returns all items linked to that category. Choosing a second category returns all items linked to both categories, and so on. Each category may have multiple sub-categories listed beneath it. The numbers appearing by each category indicate the number of items returned by clicking on that category. The search engine will locate items by searching five main descriptive fields: title, summary, creator, date, and call number. If a transcription is available for an item, the search engine will also search the transcription. The tabs feature available on most web browsers enables users to easily navigate between Kansas Memory search results and item view screens. First, browse Kansas Memory to retrieve the search results desired, then open individual items listed in the results in a new tab (control + click on the item). When you are finished viewing that item, just close the tab to return to your search results. This way you can view multiple pages of an item and still easily return to continue browsing your search results. The curriculum standards category correlates a select set of primary sources with Kansas history standards for the 7th and 11th grades and is intended primarily for use by educators. This category displays only if the user identifies him/herself as a teacher in their user profile. The Kansas Memory browser defaults to teacher mode for those users identified as teachers. Teacher mode includes only the select set of sources correlated to state history standards. Users can turn off teacher mode to browse/search the entire content of the site by selecting Teacher at the top menu. From the sidebar on the right, under Syndication, you can subscribe to updates of the twenty-five newest items added to Kansas Memory, or to audio podcasts featuring readings of sources in Kansas Memory. Just select the feed you want, choose a feed reader, and click the subscribe button. The reader will periodically check the feed for new content and download any updates. You can also subscribe to another user's recently viewed items. Just click the RSS link while viewing a user's profile, then choose a reader and subscribe. State Archives Reference Staff handle requests for reproductions of Kansas Memory items. Call 785-272-8681, ext. 117 or email our Reference Staff. Please see also our price list and our permission and use fees policy. The Kansas Memory project and the Kansas Historical Society respect copyright and other laws governing access to historic records. Materials appear on Kansas Memory only after a risk assessment has determined that dissemination via the Internet will not violate the rights of known copyright holders or state or federal privacy laws. The presence of digital images of historical materials from the collections of the Kansas Historical Society on the Kansas Memory website (kansasmemory.org) does not constitute permission to use such images. The Kansas Historical Society requires everyone wishing to use such images outside the context of kansasmemory.org to complete and return a permission form and pay applicable use fees. The Kansas Historical Society charges non-profit and commercial users fees in order to support the maintenance of the collections. Use fees will be determined from the information on the permission form. Please read, supply requested information, sign and return this form to the Curator of Photographs, Center for Historical Research, 6425 SW Sixth Avenue, Topeka, KS 66615-1099; Phone: (785) 272-8681 ext. 283; Fax: (785) 272-8682; Email: KSHS.reference@ks.gov. The Kansas Memory project and the Kansas Historical Society respect copyright and other laws governing access to historic records. Materials appear on Kansas Memory only after a risk assessment has determined that dissemination via the Internet will not violate the rights of known copyright holders or state or federal privacy laws. Materials of unclear or indeterminate provenance for which copyright holders are not known or cannot be located may appear on Kansas Memory for noncommercial educational and research purposes only under an assertion of fair use (17 U.S.C. 107). Use of material and/or copies made under the 'fair use' provision of copyright law does not imply or include permission to publish the materials used or copied. It is the responsibility of the patron to request and obtain permission to publish materials from both the repository (as owner of the physical original) and the copyright owner, if the repository does not own the copyright. 1.Credit Line: The credit line must read "Kansas Historical Society" or if downloaded from Kansasmemory.org, use "KansasMemory.org, Kansas Historical Society". Images downloaded from Kansasmemory.org and used on a web site must have the following credit line "KansasMemory.org, Kansas Historical Society, Copy and Reuse Restrictions Apply". For images not on Kansasmemory.org and used on a web site the statement must read "Kansas Historical Society, Copy and Reuse Restrictions Apply". For all web uses the credit line must be placed near the image. from all web pages containing images from our collection. 4. Use fees: The Kansas Historical Society charges use fees to support the preservation and maintenance of our collections. Use fees must be paid in full prior to the date of publication, broadcast, exhibition, merchandise creation, etc. Use fees will not be refunded. 5. Indemnification: The user agrees to defend, indemnify, save, and hold harmless the Kansas Historical Society, its employees, officers or designates, from any and all costs, expense, damage and liability arising because of any claim whatsoever which may be presented by anyone for loss or damage or other relief occasioned or caused by the release of said materials to the undersigned and their use in any manner, including their inspection, publication, reproduction, broadcast, duplication or printing by anyone for any purpose whatsoever. 6. Image Manipulation: The Kansas Historical Society's primary interest is to protect the integrity of the original. The Society will not allow the inversion of the original or the removal (except for allowable cropping) or addition of content. We will allow adjustments to contrast and sharpness. Images may be cropped at the edges or a portion may be selected from within an image. An explanatory statement must be added describing any changes. The Curator of Photographs must approve any manipulation of the materials beyond that stated in the policy. 7. Endorsement: Use of materials from the Kansas Historical Society does not imply that the Society endorses any product, enterprise, expressed opinions, or confirms the accuracy of any content on a web site, in publication, and broadcast. 8. Web Site Use: Images may be distributed via the World-Wide Web, as part of a single online display, exhibit, site or online collection. Any additional or different use of the image(s) will require renegotiation. 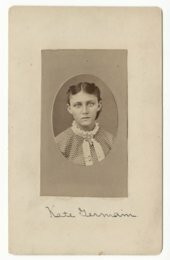 Image Resolution: The Kansas Historical Society normally will not allow an image higher than 150 dpi to be placed on a web site. Arrangements for higher resolution must be made with the Curator of Photographs. 9. Noncompliance: The Kansas Historical Society reserves the right to refuse to grant permission and/or provide imaging and audiovisual services to anyone who has not complied with our policies. Please note: The user assumes all responsibility for conforming with the laws of libel and copyright which may be involved in the use of these materials. Yes, please include the credit line, "KansasMemory.org, Kansas Historical Society" near the image in your presentation. To download an image, right click on the image, select the "save image as" option, and save the image to your preferred location. To print an item in Kansas Memory, use the button on the item page. This will deliver a pdf document suitable for printing. A title sheet with descriptive information will also be included. Items with many pages will be divided into multiple sections. Each section must be printed individually. To buy a high-quality photo print, contact our reference staff at KSHS.reference@ks.gov or 785-272-8681, ext. 117. Please see also our price list and our permission and use fees policy. Cookies are small pieces of text sent back and forth between a browser and a server. They contain information that the server may need to identify you while you access a website. Kansas Memory places a small cookie on your browser that helps keep your login session active and remembers your browsing preferences. Your browser must accept cookies if you wish to log in to Kansas Memory to use features such as My Bookbag. If your browser does not accept our cookie, you will still be able to browse Kansas Memory, but you will not be able to customize the site or log in. The State Archives and Library at the Kansas Historical Society developed Kansas Memory in part with funds provided by the Information Network of Kansas.